Back in the past, I wanted to make the smallest possible executables on UNIX-ish operating systems (SunOS, Tru64, OS9, OpenVMS and others). As a result of my research I wrote a couple of small tutorials for various hacking-related magazines (like Phrack or x25zine). Doing the same on AmigaOS naturally became a topic of interest for me - even more so when I started seeing, in Amiga forums, questions like "Why are AmigaOS4 binaries bigger than they should be?" Therefore I believe that producing small OS4 executables could make an interesting topic for an article. Further in the text I'll explain how ldscripts can help the linker make non-aligned binaries, and cover various other aspects associated with the topic. I hope that at least for programmers the article will be an interesting and thought-provoking read. Before you go on, please note that it is assumed here that you have basic programming skills and understanding of C and assembler, that you are familiar with BSD syntax, know how UNIX and AmigaOS3/4 work, and that you have the PPC V.4-ABI and ELF specification at hand. But if you don't, there's no need to stop reading as I'll try to cover the basics where necessary. To begin with, let's present and discuss some basic terms and concepts. We'll also dispel some popular myths. Thirty years ago, when the C language developed so much that its different implementations started to pose a practical problem, the American National Institute of Standards (ANSI) formed a committee for the standardization of the language. The standard, generally referred to as ANSI C, was finally adopted in 1989 (this is why it is sometimes called C89). Part of this standard was a library including common functions, called the "C standard library", or "C library", or "libc". The library has been an inherent part of all subsequently adopted C standards. Libc is platform-independent in the sense that it provides the same functionality regardless of operating system - be it UNIX, Linux, AmigaOS, OpenVMS, AROS, whatever. The actual implementation may vary from OS to OS. For example in UNIX, the most popular implementation of the C standard library is glibc (GNU Library C). But there are others: uClibc (for embedded Linux systems, without MMU), dietlibc (as the name suggests, it is meant to compile/link programs to the smallest possible size) or Newlib. Originally developed for a wide range of embedded systems, Newlib is the preferred C standard library in AmigaOS4 and is now part of the kernel. On AmigaOS4, three implementations of libc are used: clib2, newlib and vclib. The GCC compiler supports clib2 and newlib, the VBCC compiler supports newlib and vclib. A better and more modern libc implementation. While the AmigaOS4 version is closed source (all adaptations and additional work is done by the OS development team), it's based on the open source version of Newlib. The original version is maintained by RedHat developer Jeff Johnston, and is used in most commercial and non-commercical GCC ports for non-Linux embedded systems: http://www.sourceware.org/newlib/ Newlib does not cover the ANSI C99 standard only: it's an expanded library that also includes common POSIX functions (clib2 implements them as well). But certain POSIX functions - such as glob(), globfree(), or fork() - are missing; and while some of them are easy to implement, others are not - fork() being an example of the latter. Newlib is also available as a shared object. This library was made for the vbcc compiler. Like clib2 it is linked statically, but only provides ANSI C/C99 functions (i.e. no POSIX). From time to time you can hear voices saying that AmigaOS4 is becoming UNIX. This popular myth stems from three main sources. First, many games, utilities and libraries are ported over from the UNIX world. 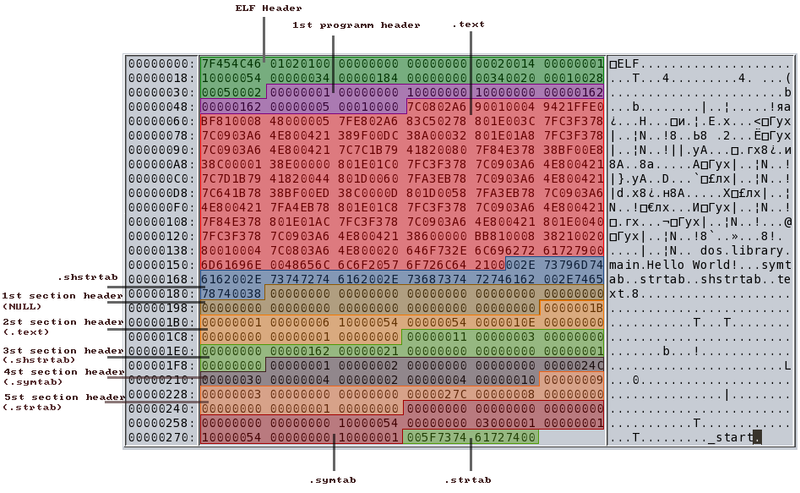 Second, AmigaOS4 uses genuine ELF, the standard binary file format used in UNIX and UNIX-like systems. Third, the OS supports, as of version 4.1, shared objects. All of this enables AmigaOS4 to provide more stuff for both programmers and users, and to complement native applications made for OS4. Today, it is quite normal that an operating system provides all the popular third-party libraries like SDL, OpenGL, Cairo, Boost, OpenAL, FreeType etc. Not only they make software development faster but they also allow platform-independent programming. Yet getting close to UNIX or Linux in terms of software or programming tools does not mean that AmigaOS4 behaves in the same way as regards, for example, library initialization, passing arguments or system calls. On AmigaOS4 there are no "system calls" as they are on UNIXes, where you can simply pass arguments to registers and then use an instruction (like "int 0x80h" on x86 Linux, "trap 0" on M68 Linux, or "sc" on some PPC/POWER CPU based OSes), which will cause a software interrupt and enter the kernel in supervisor mode. The concept of AmigaOS is completely different. 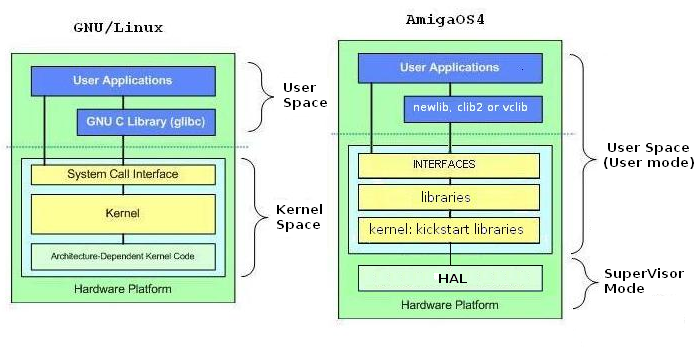 There is no kernel as such; Amiga's Kickstart is actually a collection of libraries (of which "kernel.kmod" is just one module - a new incarnation of the old exec.library). Also, an AmigaOS program, when calling a library function, won’t enter supervisor mode but rather stays in user mode when the function is executed. Since the very first version of the OS that came with the Amigas in 1985, you must open a library and use its vector table to execute a library function, so there’s no "system call" involved. The pointer to the first library (exec.library) is always at address 4 and that hasn’t changed in AmigaOS4. By the way, the Quark kernel on MorphOS uses the "sc" instruction for system calls (so it does support them) but the programmers will never use them because they work with the libraries (just like you do on AmigaOS4). When you program in assembler under AmigaOS4, you cannot do much until you initialize and open all the needed libraries (unlike, for example, on UNIX where the kernel does all the necessary initialisation for you). 6/0.RAM Disk:> objdump -D --no-show-raw-insn --stop-address=0x10000d0 test | grep -A8 "_start"
The address in the last instruction points to a data segment starting at 0x010100000. But the address is invalid because, without any relocation, there is no data there and the MMU produces a data storage interrupt (DSI) error. Of course it is possible to make a working binary without relocation, if the program doesn’t need to relocate and you are lucky enough to have the 0x1000000 address free of important contents. And of course you can use a different address for the entry point, by hex-editing the binary or at build-time using self-made ldscripts. Making a non-relocatable binary will be discussed further in the text. In case you are not familiar and have no experience with PowerPC assembly, the following section will explain some basic terms and concepts. Important note: This general-purpose register description shows that arguments can only be passed in registers r3 and above (that is, not in r0, r1 or r2). You need to keep that in mind when assembling/disassembling under AmigaOS4. There are many different PowerPC instructions that serve many different purposes: there are branch instructions, condition register instructions, instructions for storage access, integer arithmetic, comparison, logic, rotation, cache control, processor management, and so on. In fact there are so many instructions that it would make no sense to cover them all here. You can download Freescale’s Green Book (see the Links section at the end of the article) if you are interested in a more detailed description but we’ll just stick to a number of instructions that are interesting and useful for our purposes. Relative branch on address (example: "b 0x7fcc7244"). Note that there are both relative and absolute branches (ba). Relative branches can branch to a distance of -32 to +32MB. Absolute branches can jump to 0x00000000 - 0x01fffffc and 0xfe000000 - 0xfffffffc. However, absolute branches will not be used in AmigaOS programs. Branch with count register. It uses the count register as a target address, so that the link register with, say, our return address remains unmodified. "move to link register". In reality this is just a mnemonic for "mtspr 8,r". The instruction is typically used for transferring an address from register r0 to the link register (lr), but you can of course move contents to lr from other registers, not just r0. "store word and update" (all instructions starting with “st” are for storing). For example, stwu %r1, -16(%r1) stores the contents of register r1 into a memory location whose effective address is calculated by taking the value of 16 from r1. At the same time, r1 is updated to contain the effective address. As we already know, register r1 contains the stack-frame pointer so our instruction stores the contents of the register to a position at offset -16 from the current top of stack and then decrements the stack pointer by 16. The PowerPC processor has many more instructions and various kinds of mnemonics, all of which are well covered in numerous PPC-related tutorials, so to avoid copying-and-pasting (and wasting space here) we have described a few that happen to be used very often. You’ll need to refer to the relevant documentation if you want to read more about the PowerPC instruction set (see Links below). When a C function executes, its code – seen from the assembler perspective – will contain two parts called the prologue (at the beginning of the function) and the epilogue (at the end of the function). The purpose of these parts is to save the return address so that the function knows where to jump after the subroutine is finished. The prologue code generally opens a stack frame with a stwu instruction that increments register r1 and stores the old value at the first address of the new frame. The epilogue code just loads r1 with the old stack value. C programmers needn’t worry at all about the prologue and epilogue because the compiler will add them to their functions automatically. When you write your programs in pure assembler you can skip the prologue and the epilogue if you don’t need to keep the return address. Plus, a new stack frame doesn’t need to be allocated for functions that do not call any subroutine. By the way, the V.4-ABI (application binary interface) defines a specific layout of the stack frame and stipulates that it should be aligned to 16 bytes. There are two ways to write assembler programs under AmigaOS4: --[i]using libc[/i] (all initializations are done by crtbegin.o/crtend.o and libc is attached to the binary) --[i]the old way[/i] (all initializations - opening libraries, interfaces etc. - have to be done manually in the code) The advantage of using libc is that you can run your code "out of the box" and that all you need to know is the correct offsets to the function pointers. On the minus side, the full library is attached to the binary, making it bigger. Sure, a size difference of ten or even a hundred kilobytes doesn’t play a big role these days – but here in this article we’re going down the old hacking way (that’s why we’re fiddling with assembler at all) so let’s call it a drawback. The advantage of not using libc is that you gain full control of your program, you can only use the functions you need, and the resulting binary will be as small as possible (a fully working binary can have as little as 100 bytes in size). The drawback is that you have to initialize everything manually. We’ll first discuss assembler programming with the use of libc. 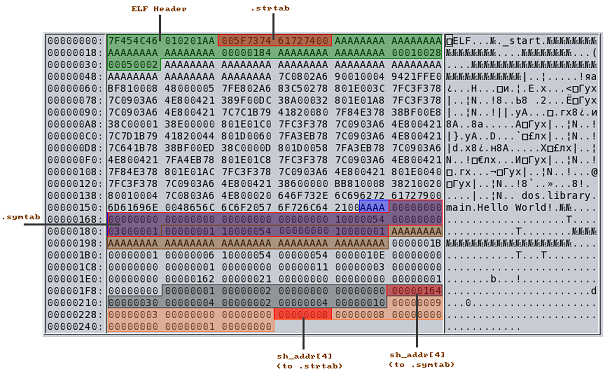 Breakpoint 1 at 0x7fcc7208: file 2.c, line 4. Now we’ll use GDB to disassemble the printf() and exit() functions from Newlib’s LibC.a. As mentioned above, Newlib is used by default, there’s no need to use the –mcrt switch unless we want clib2 instead (in which case we’d compile the source with “-mcrt=clib2”). 6/0.RAM Disk:> objdump -d 1 | grep -A5 "<__NewLibCall>:"
7/0.RAM Disk:> objdump -dr 1 | grep -A7 "<__NewLibCall>:"
You can write a simple script that will parse the disassembly and give you the list in any form you wish. Right, so we got down to 4624 bytes. A little better when compared with the libc version (which was 5336 in size), but still too much for a Hello World program. To obtain the numerical values that identify system functions, you need to study the interface description XML files that are provided in the AmigaOS4 SDK. For example, for exec.library functions you need to read the file “SDK:include/interfaces/exec.xml”. 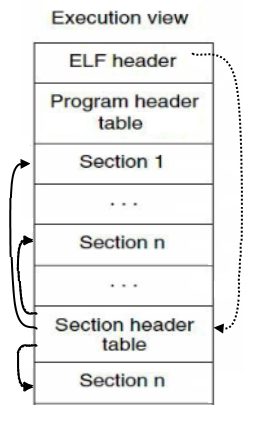 All interfaces contain a jump table. The offset for the first interface "method" is 60, the next one is 64 and so on. So you just open the appropriate interface description XML file, start counting from 60, and add +4 for any method that follows. db 0,0x14              ; 14h = powerpc. db 0,2                 ; e_phnum - number of entires in the program header table. 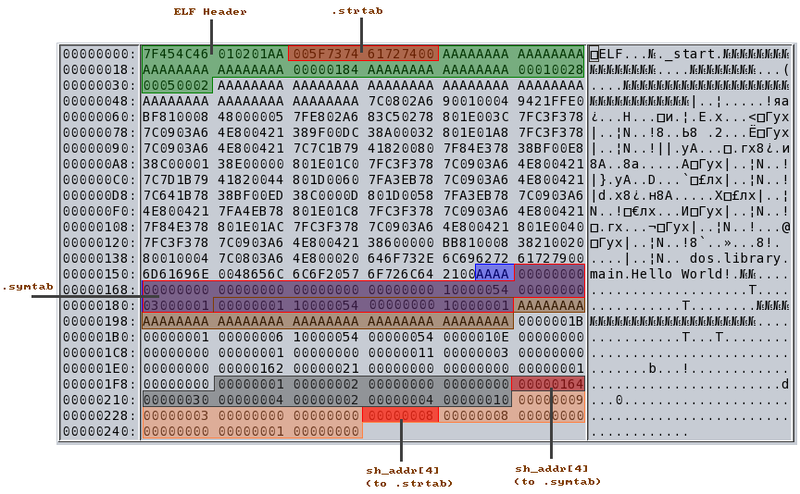 Take a look at the image below, which shows an ELF header in which all unparsed bytes are marked by "A" letters. You can use these bytes for anything you want. As a result, the size of our binary becomes mere 588 bytes, and the executable still works of course. Tools like 'readelf' will surely be puzzled by such custom-hacked ELF files, but we only need to worry about what the ELF loader thinks about them. If the loader is happy, the binary is working and the code is executed in memory. In the bonus directory that comes with this article, you can try out an example binary the altered structure of which is depicted by the image above. In the binary, .strtab (the _start symbol) is moved to the program section header, and .symtab is moved on top of .shstrtab + the NULL section header (see directory "bonus/shift_sections"). The article, of course, aims at encouraging learning. If you are an application programmer, you'll probably never need to use assembler directly or construct ELFs from scratch byte per byte. But the knowledge of how things work at low level can help you understand and resolve many problems that may turn up from time to time and that are related to compilers, linkers and assembler-code parts. Also, it can give you a better overview of the AmigaOS4 internals so when you start a project, it will be much easier for you to get rid of problems: without asking questions in the forums and losing hours fiddling with the basics.